Want to Jump-start Your Career? Let 60 Successful Executives Help. Whether you call it your "professional brand" or your reputation, what it says about you is critical to your success. What is your work place reputation? Are you taking charge and managing your brand with intentional action, or are others determining your future for you? Use the "Principles of Career Success" in Fast Forward Your Career to create the brand you want for yourself. Don't let others define who you are! 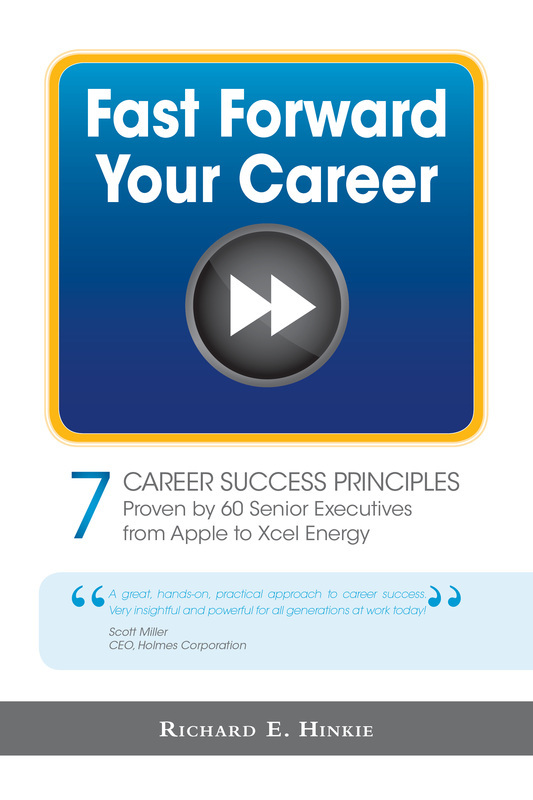 Fast Forward Your Career, written by Richard E. Hinkie and published by FriesenPress, is based on interviews with 60 highly successful professionals from corporations including: Apple, T-Mobile, Holmes Corporation, and more (including tech. companies, retailers, utilities, government agencies, and manufacturers). While many of these individuals began their careers in entry level jobs, each person uncovered their own career success principles and used them to be regularly promoted ahead of their peers. By learning from their collective knowledge in Fast Forward Your Career, you can get ahead too! Use the Button above to download my 12 Page Career Planning Toolkit! It's free and will help you make your own career plan. 5. Completing a written plan that will work because your plan is based upon the successes of 60 careers that did!